I eat a lot of granola bars. Usually before gymnastics/riding/attempting to run track. I made these (the recipe is from The Pioneer Woman) as a celebration of being in a fully functioning kitchen when we took a family trip to the Hamptons for a weekend. 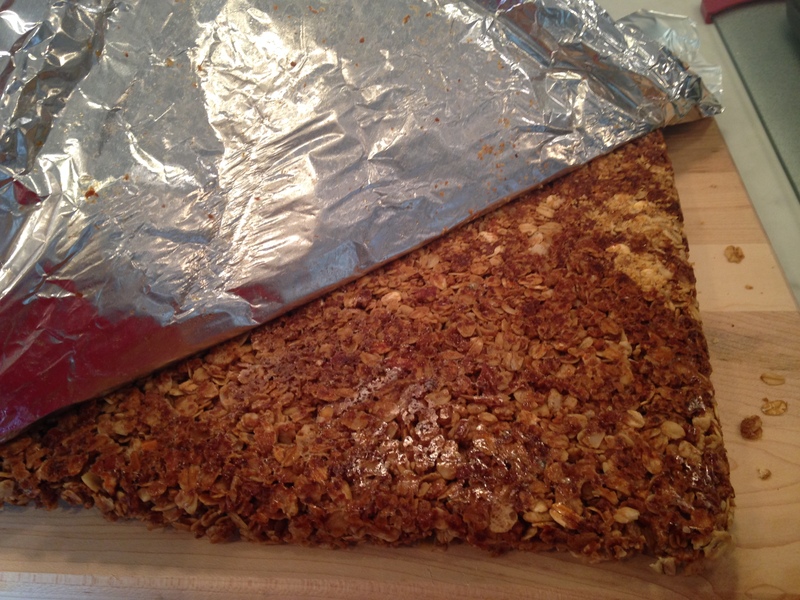 I had been dying to make them, but granola bars are definitely something that you only want to make if you have a sink and, well, a counter. This no counter thing has made baking extremely complicated. For instance, I made cupcakes the other day on a set of free-standing shelves. But they turned out nicely anyway (despite the fact that I was this close to baking my phone along with them…). I know, I know. It’s a lot of stuff. But these bars are totally and completely worth it! 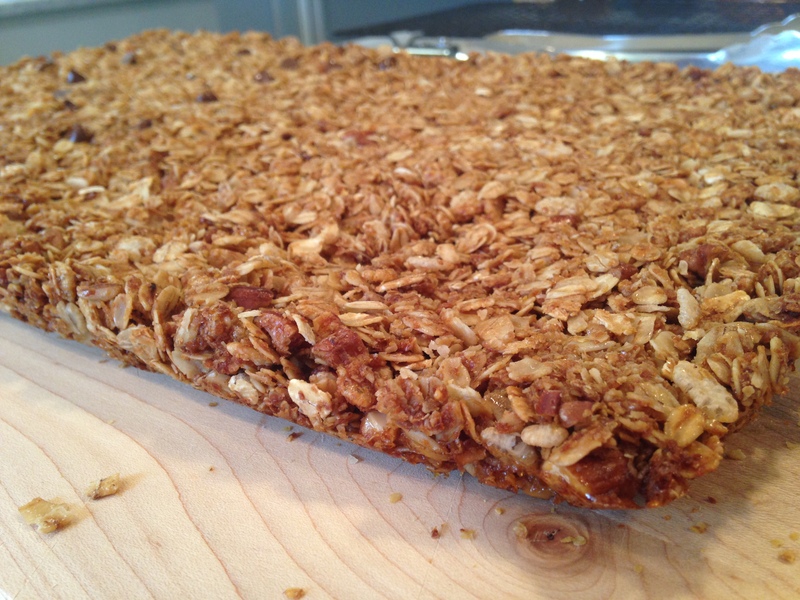 And the beauty of the granola bar is that you can always change it up– these are only suggestions. 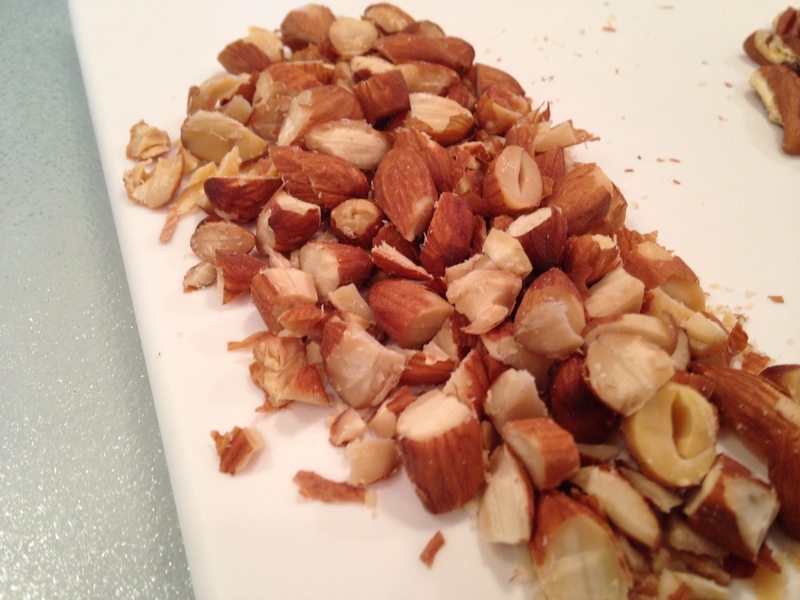 You could use different kinds of nuts, other cereals, etc. 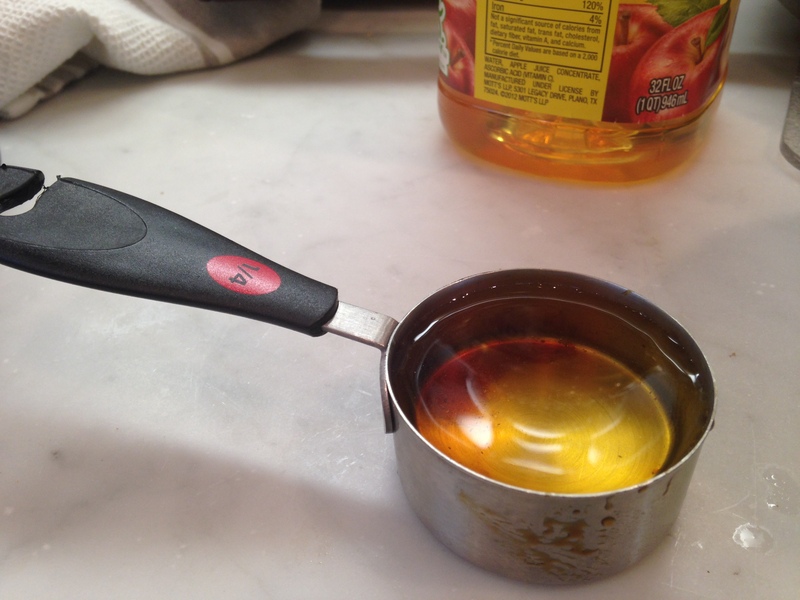 …Cause it melts if you just give it a stir! And mix in the butter. 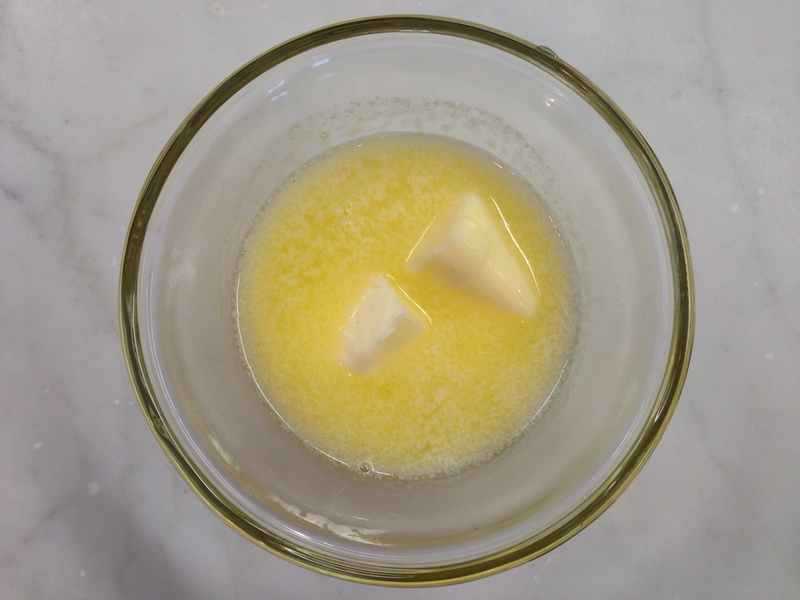 Oil and butter– pretty good start to a recipe, if you ask me. 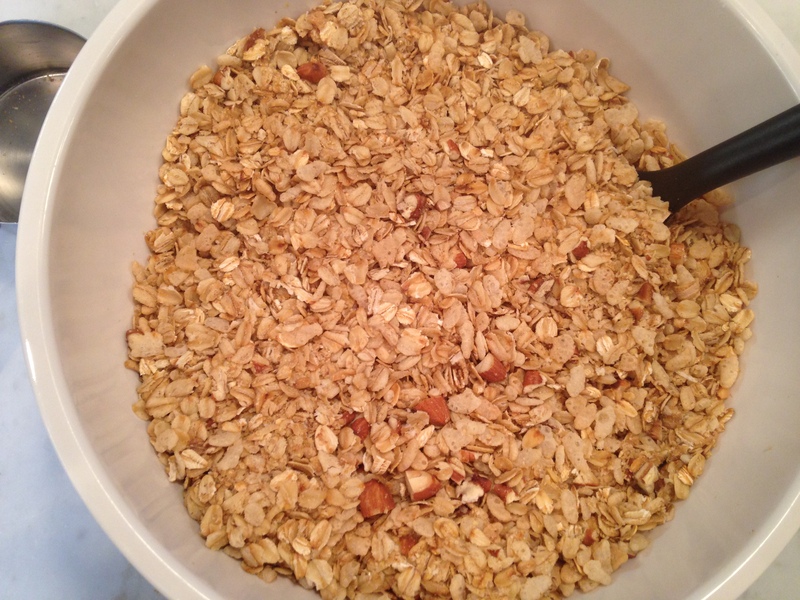 Grab yourself a large bowl and measure out 6 cups of oats. 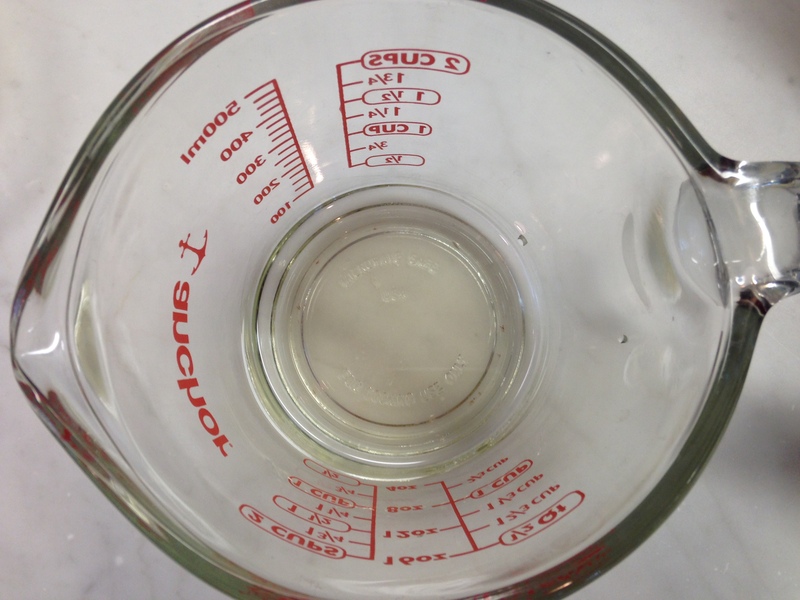 Or, if you’re like me, measure out a few cups before realizing that you are, in fact, using a 1/2 cup measure. 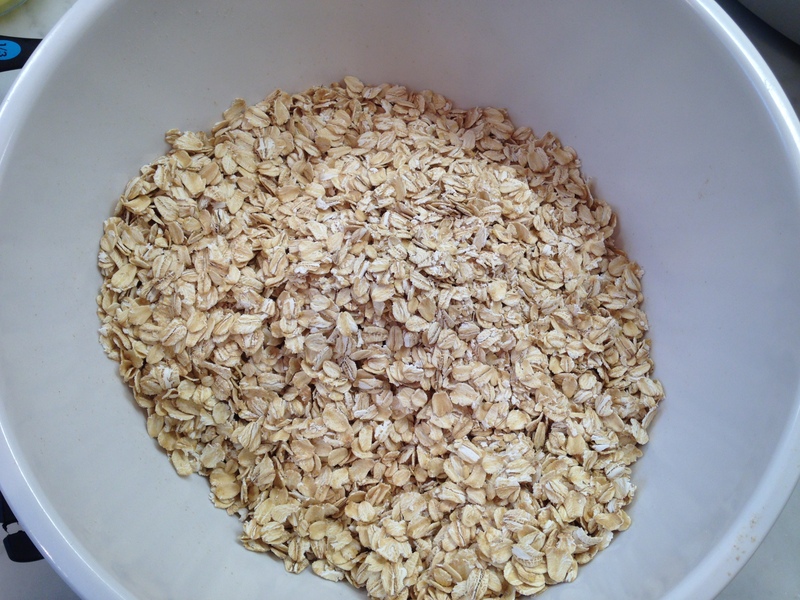 And then proceed to pour the oats back and re-measure, only to lose track halfway through. 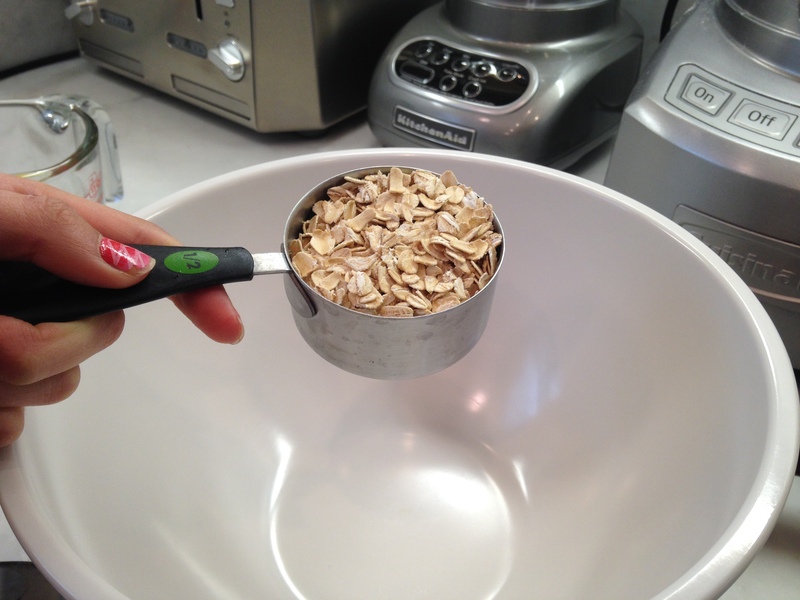 Or, you know, skip this step and just measure out the 6 cups like a normal person. Cause that’s perfectly fine too. Ah, we finally have our oats. Sorry ’bout that. 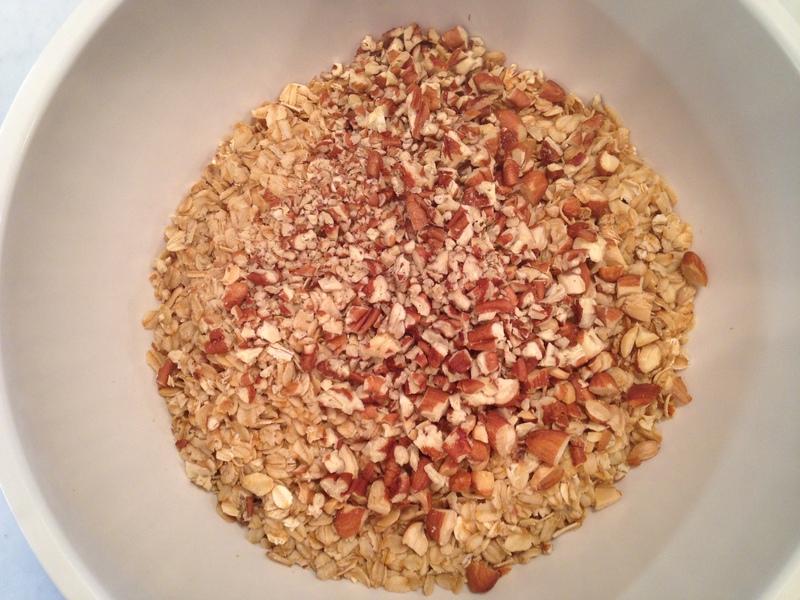 And toss it all around until the oats are nice and coated. 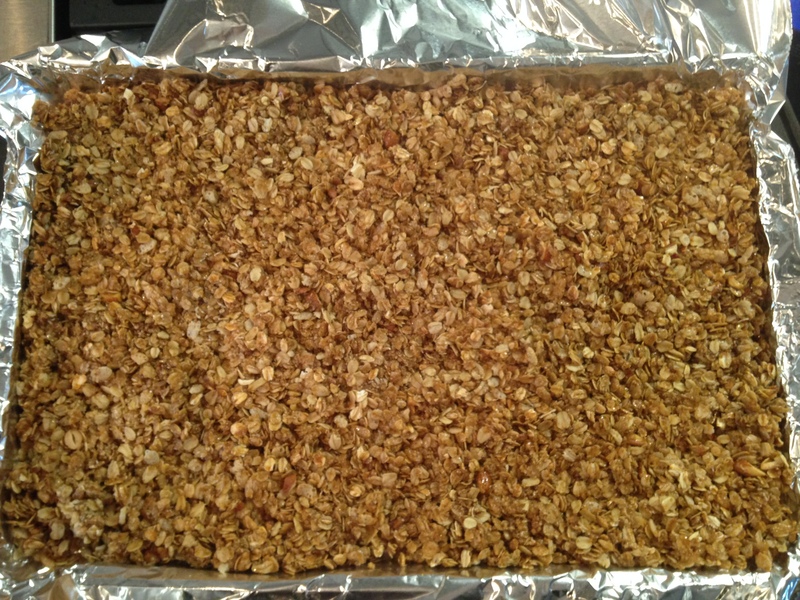 Line 2 rimmed baking sheets with parchment and pour the oats on in. Those things in the background are scones. Really tasty scones. Recipe to come in June. Toast these for 15-20 minutes. You’ll want to keep an eye on them, shaking the pans a couple of times so that they don’t burn. 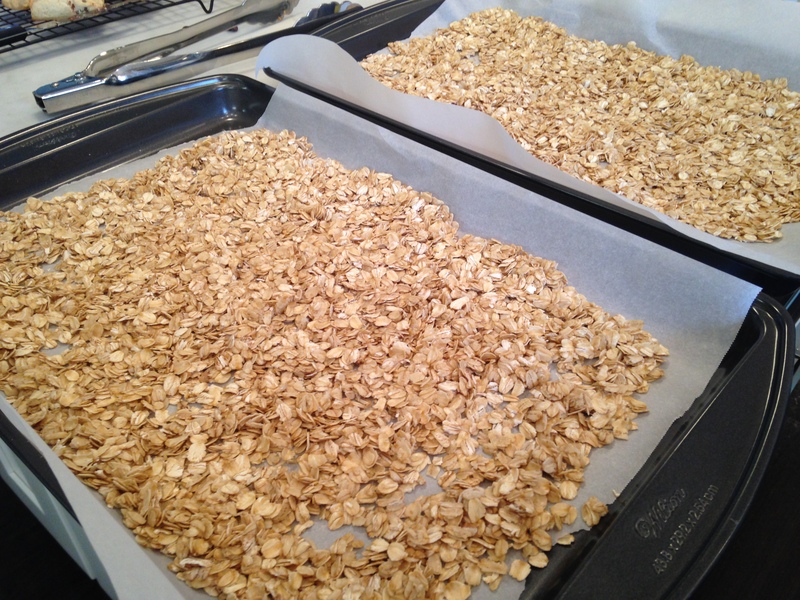 Once they’re done, let the oats cool. Your kitchen probably smells pretty good right now. 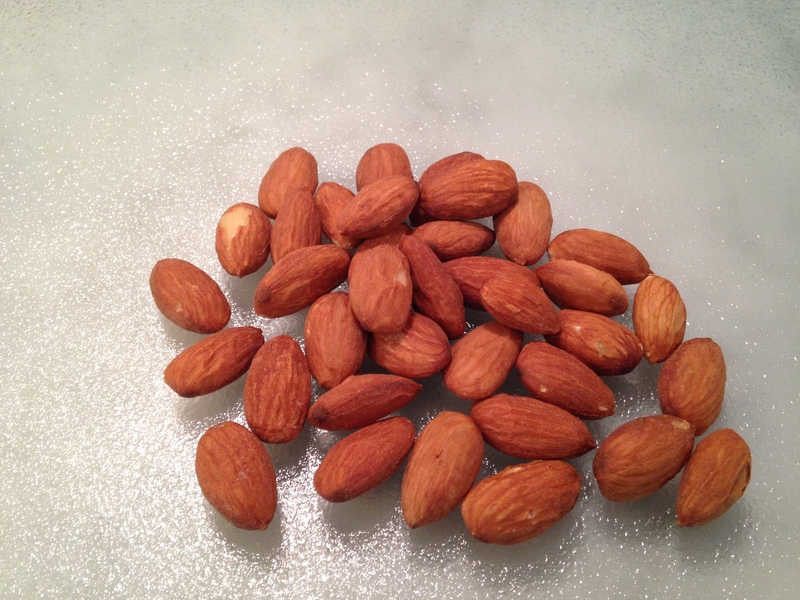 Meanwhile, get yourself a pile of almonds. I used roasted, but you could go with raw ones. Give ’em a rough chop. 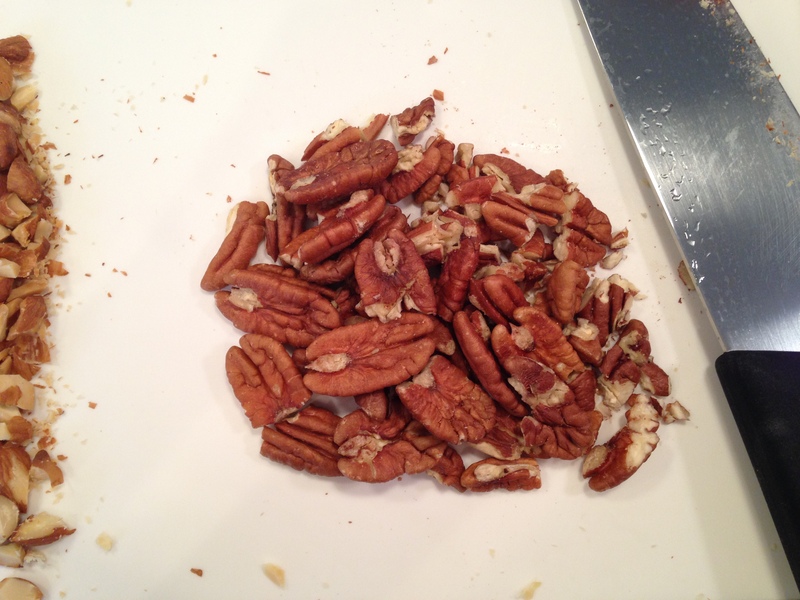 Now on to the pecans! Chop these pretty fine. That way you don’t get too many big chunks of nuts. 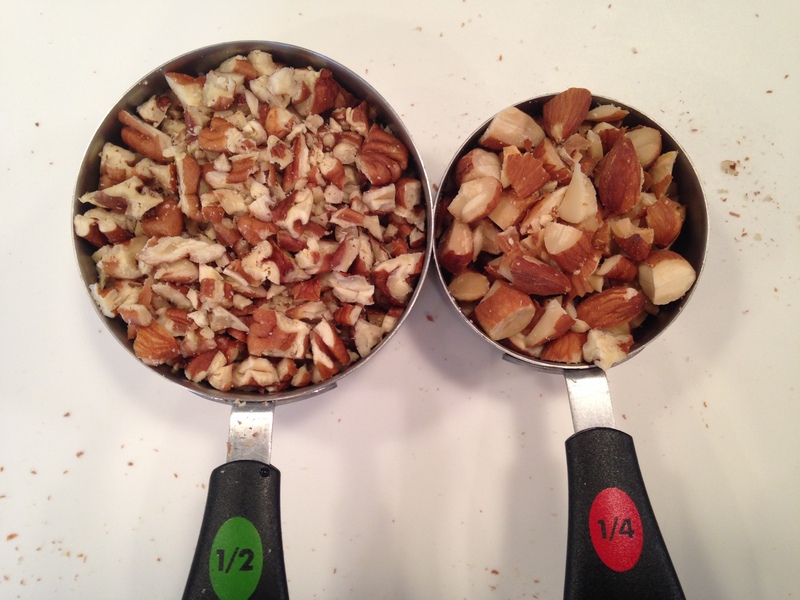 Measure out 1/2 cup of the pecans and 1/4 cup of the almonds. 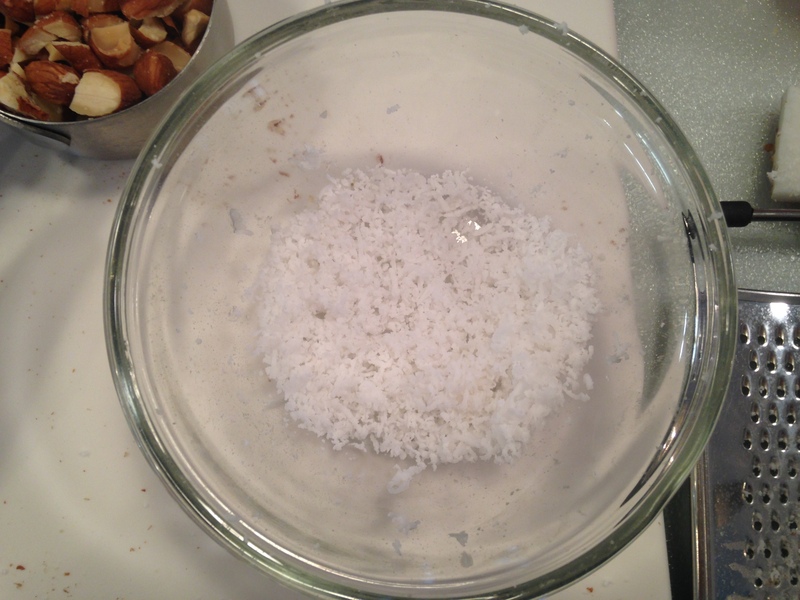 And hey, if we’re dealing with nuts right now, why not add in a little shredded coconut? I know I didn’t include it in my ingredients photo. I’m sorry. 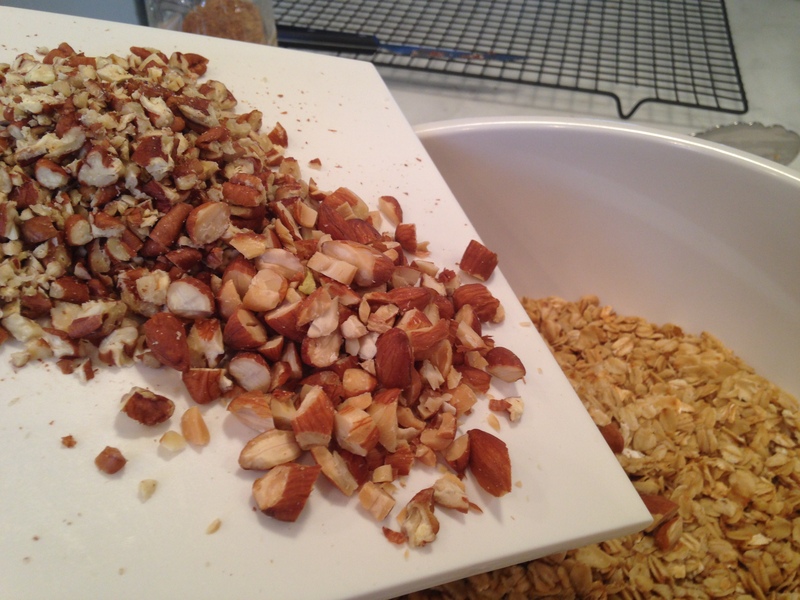 Pour the oats into a large bowl, and then throw nuts right on in with them. Add in the coconut (if you’re using it) too. …And dump it all in! Or gently sprinkle it all in. Do whatever you like. 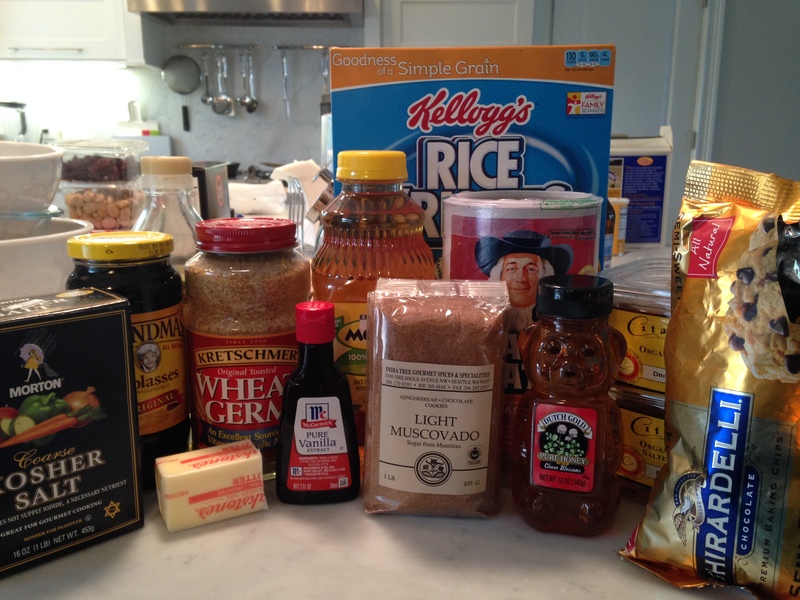 Now for the wheat germ. Add this to the party too. 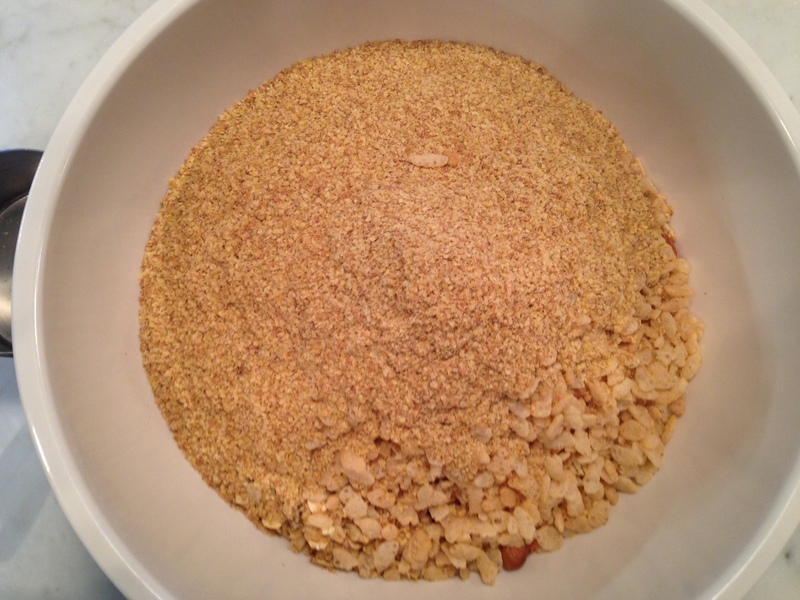 Just give all the crispy crunchy ingredients a stir so they are evenly distributed. Set this aside. Time for the ooey gooey stuff! 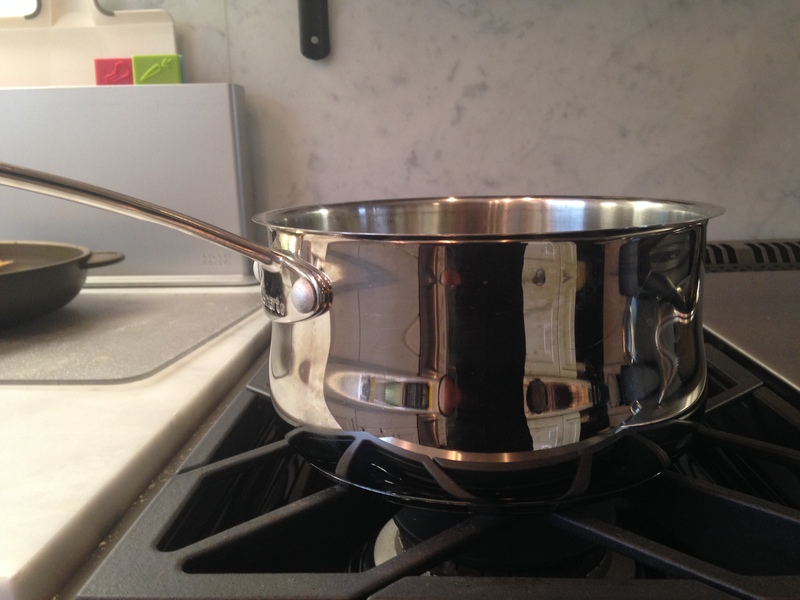 Grab a medium saucepan. 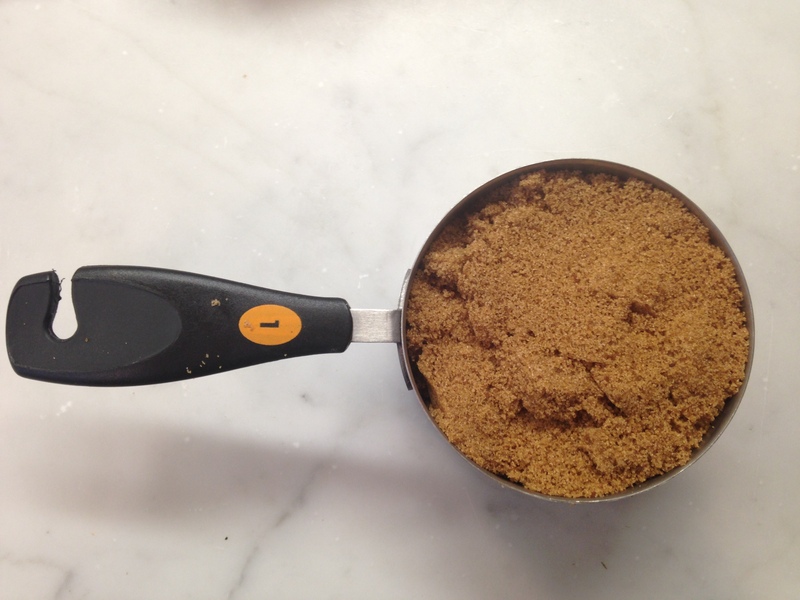 Take a scoop of brown sugar and pack it all down. Add this into your pot. 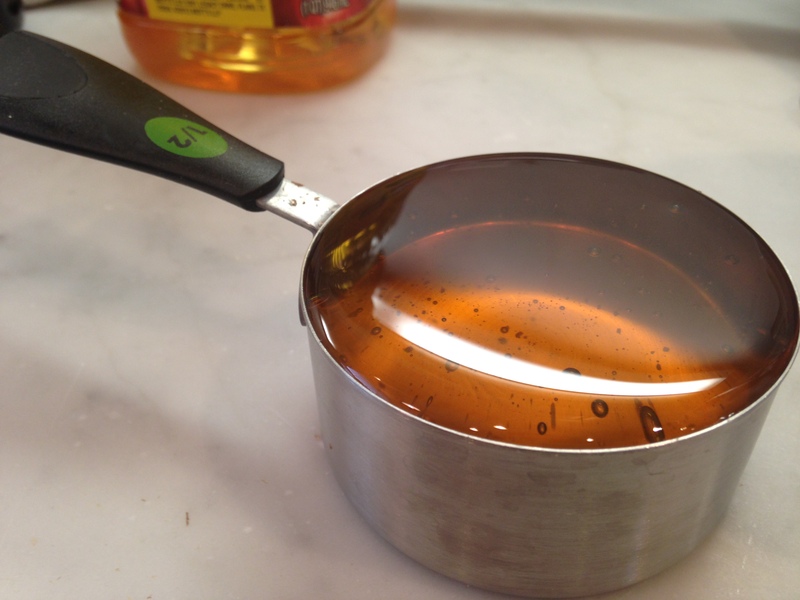 Measure out 1/2 cup of honey. Drizzle this into the pot. Taking photos of gooey stuff like honey is fun, isn’t it? Or is it just me? 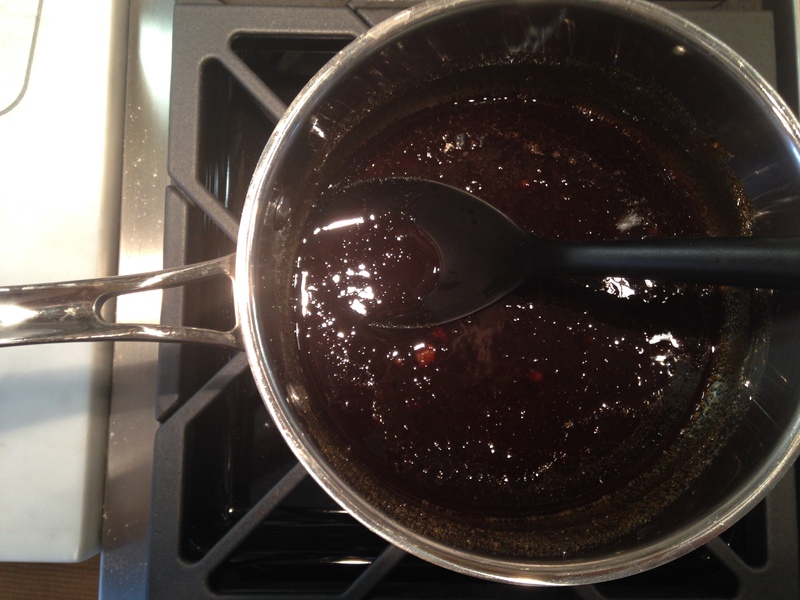 Anyway, next up is the molasses. 1/4 cup to be exact. 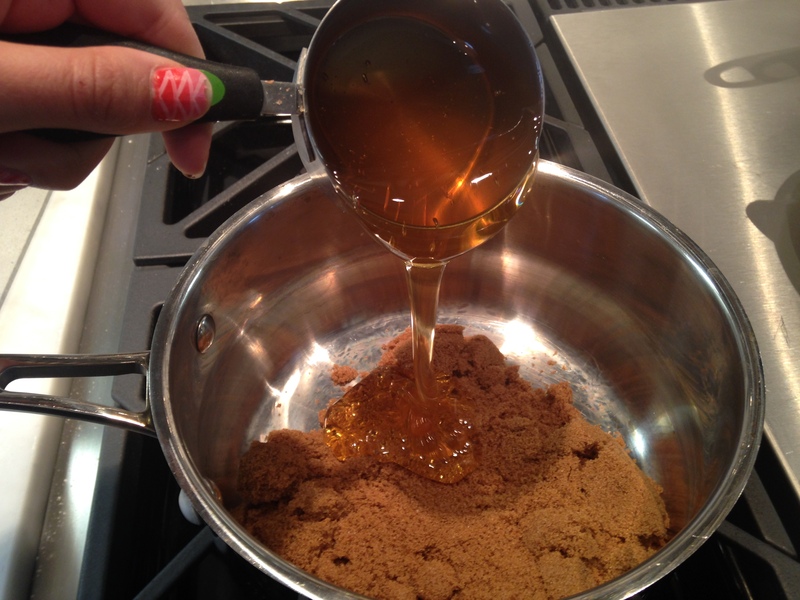 Drizzle that in just like you did with the honey! 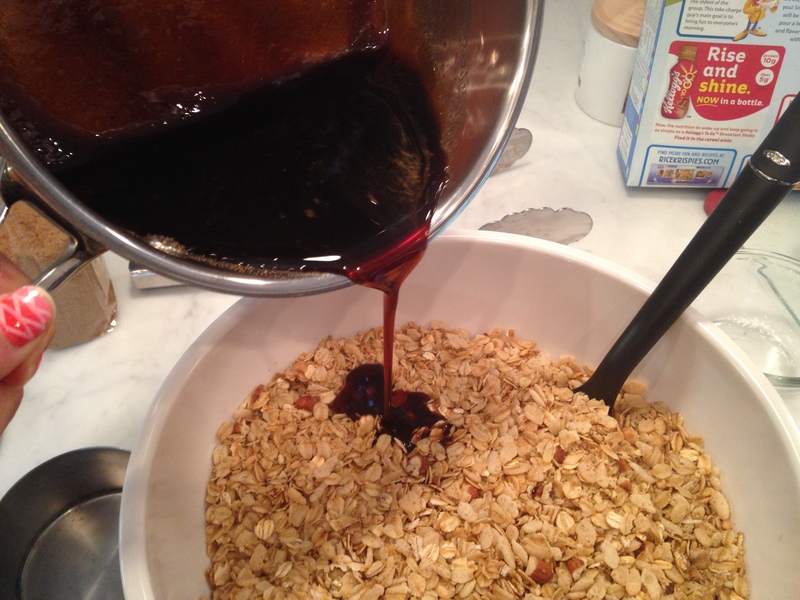 Last but not least, add in 1/4 cup of apple juice. Heat this until it’s just starting to bubble around the edges, and then turn off the stove. Stir in some vanilla. Let this sit and cool until it’s not super hot anymore– you still want it warm. Ack. Sorry, I didn’t mean to yell. Anyway, you want to pour slowly, stirring at the same time. Just mix it until everything is nice and evenly coated. And spray it with baking spray. You’ll be very very glad you did. 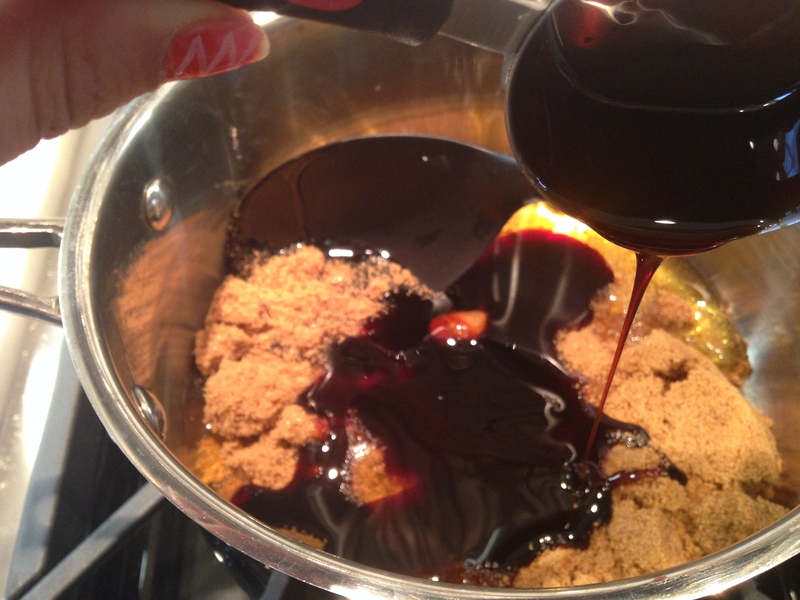 Plop the mixture right onto the sheet and try your very best to get it in a sorta-kinda-maybe uniform layer. 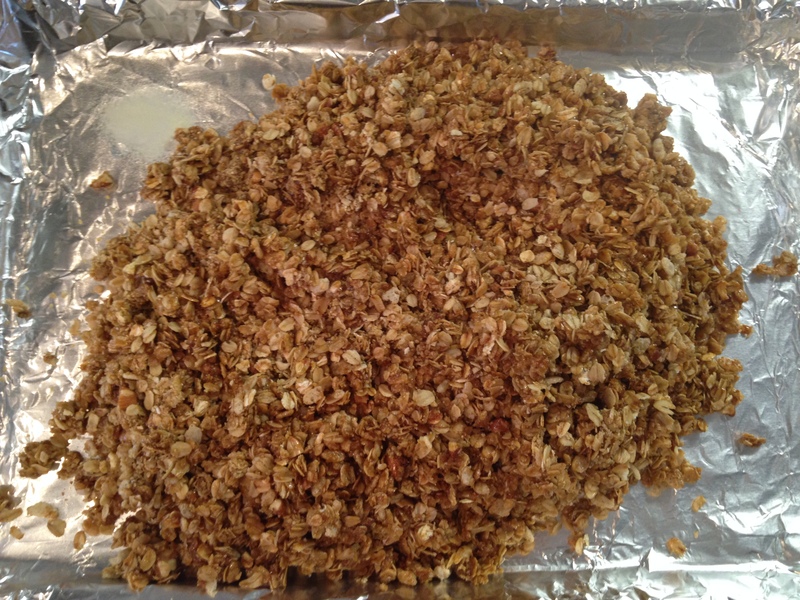 Press the granola into the pan gently (You may want to spray your hands with cooking spray for this part). I dotted half of mine with chocolate chips, but of course you don’t have to. Pop this in the oven and bake for 20-25 minutes, until it’s browned and yummy smelling. Don’t worry if it is slightly soft– it’ll get crunchier. Now, you’ve got to take a deep breath…and step away. 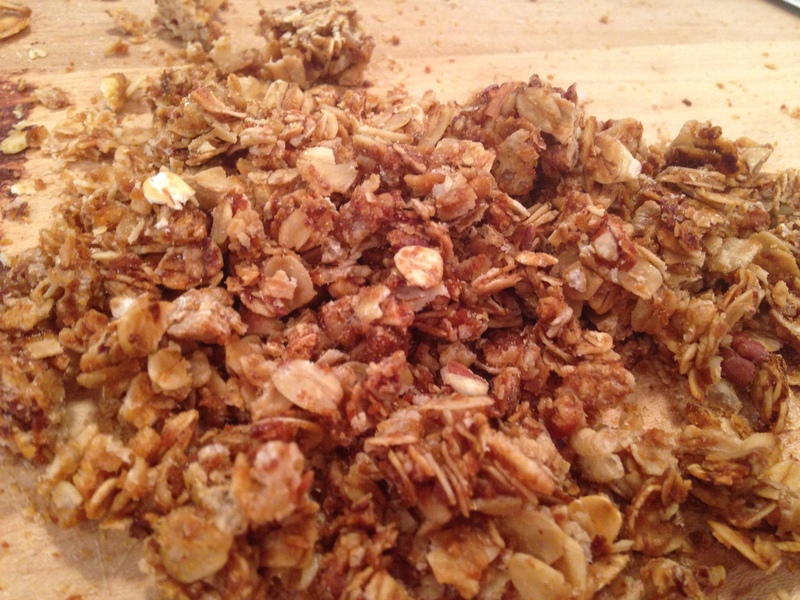 Unfortunately, the granola needs to cool before it can be cut so it can crisp up. Sigh. 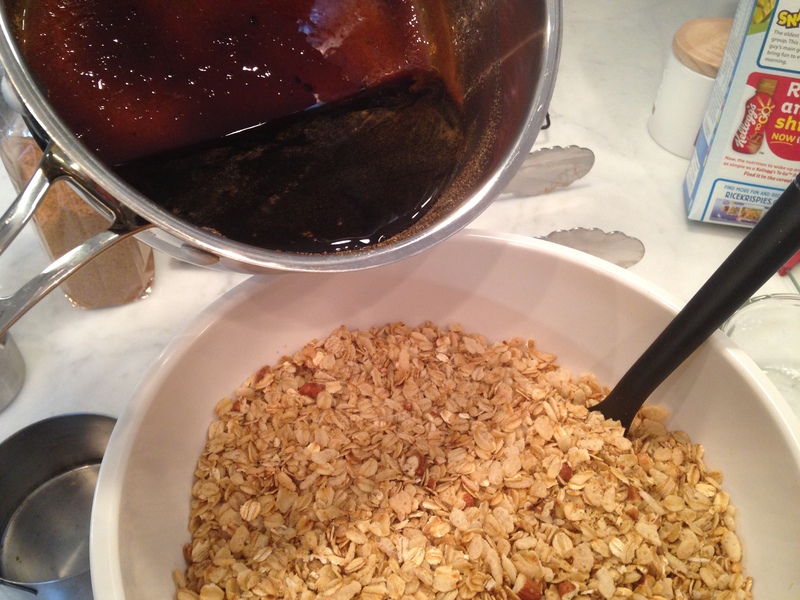 When cool, you can go ahead and flip the granola (very, very carefully!) 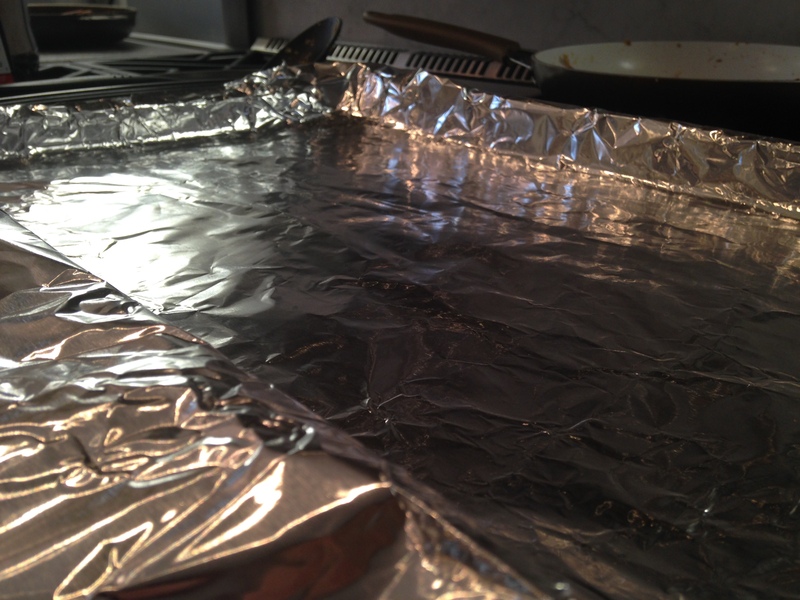 onto a cutting board and peel off the foil. All that’s left to do is the chopping! Cut them into whatever size you want– squares can be fun, too. 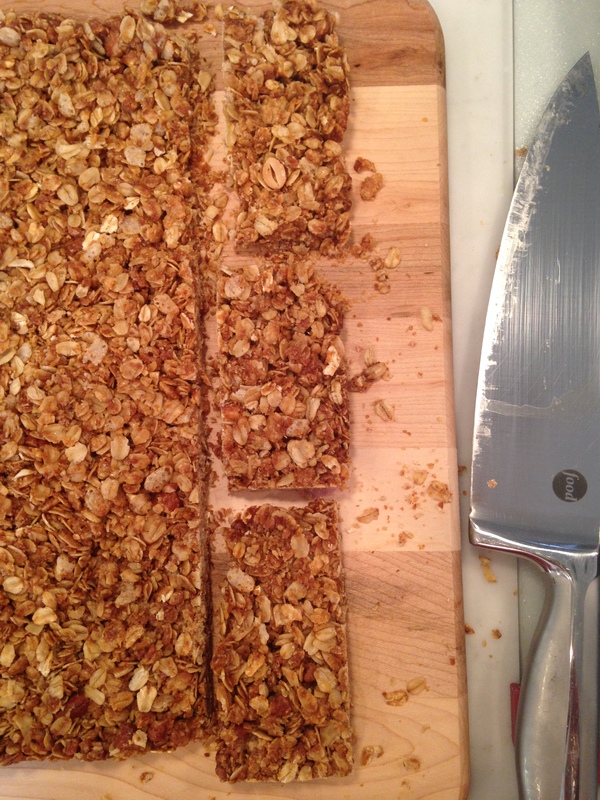 You may notice that you have some crumbs and clumps left on your cutting board… These make perfect granola! Just pack it all up in a Ziplock bag and save for breakfast. I kept the actual bars in plastic tupperware containers. 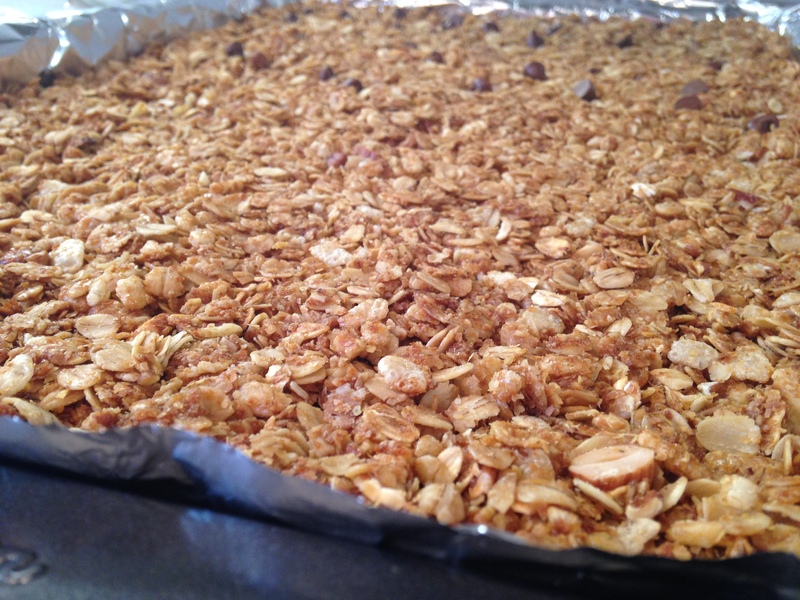 Note: For chewy granola bars with less ingredients, check this recipe out! 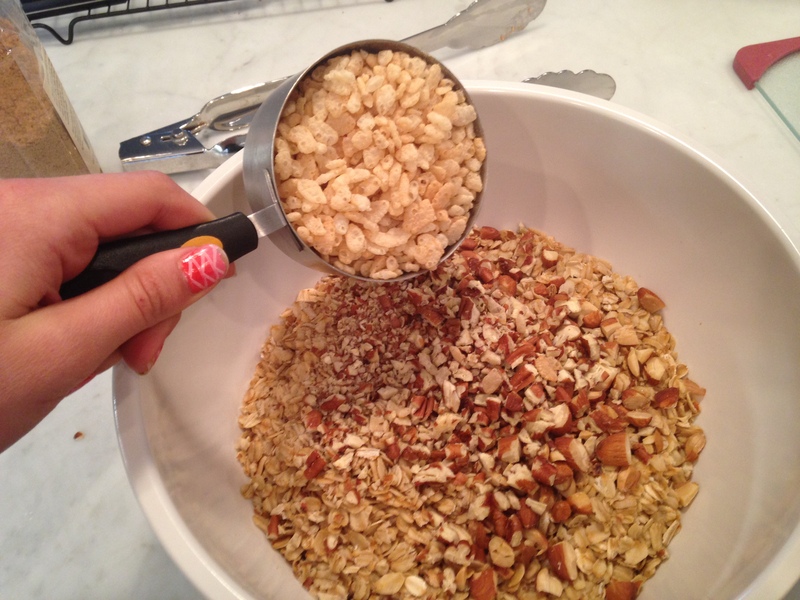 NOTE: Feel free to try out new combinations of ingredients, like using different nuts or cereals. These are just suggestions. 1. 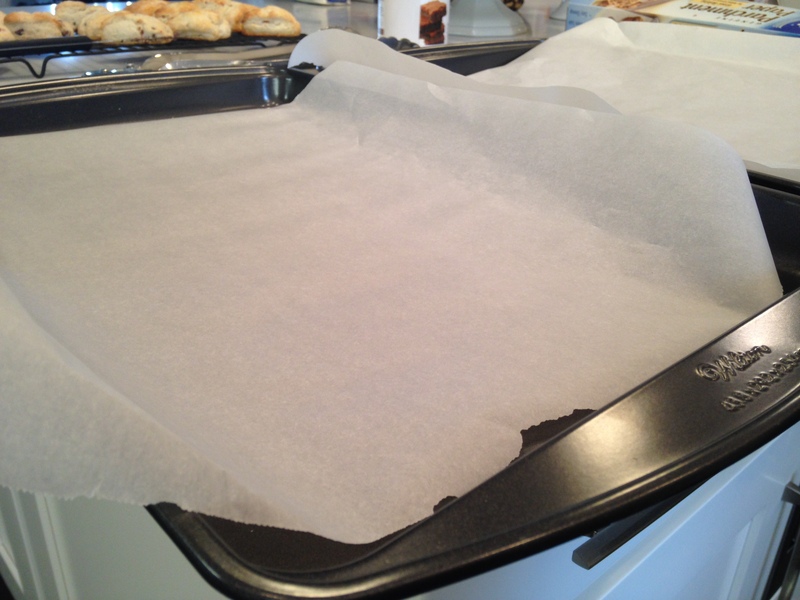 Heat oven to 350 F. Line 2 rimmed baking sheets with parchment. 2. 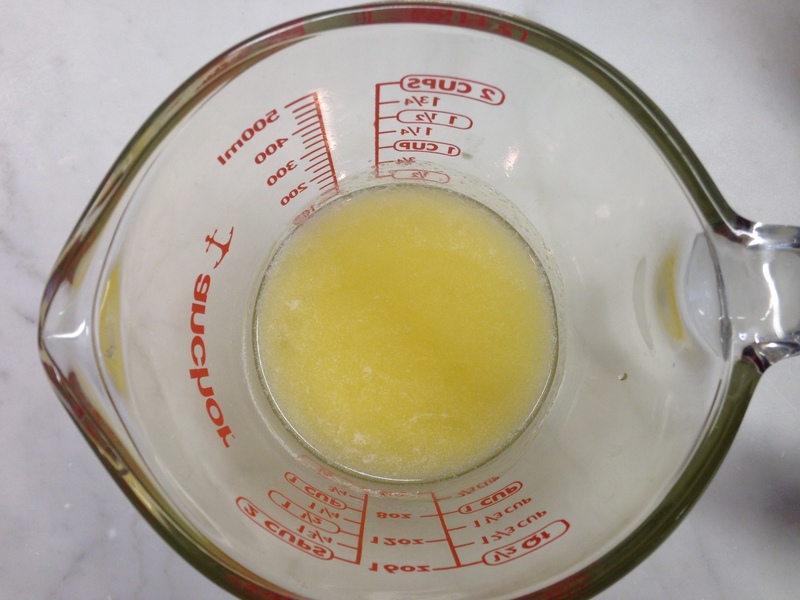 Mix melted butter and oil. 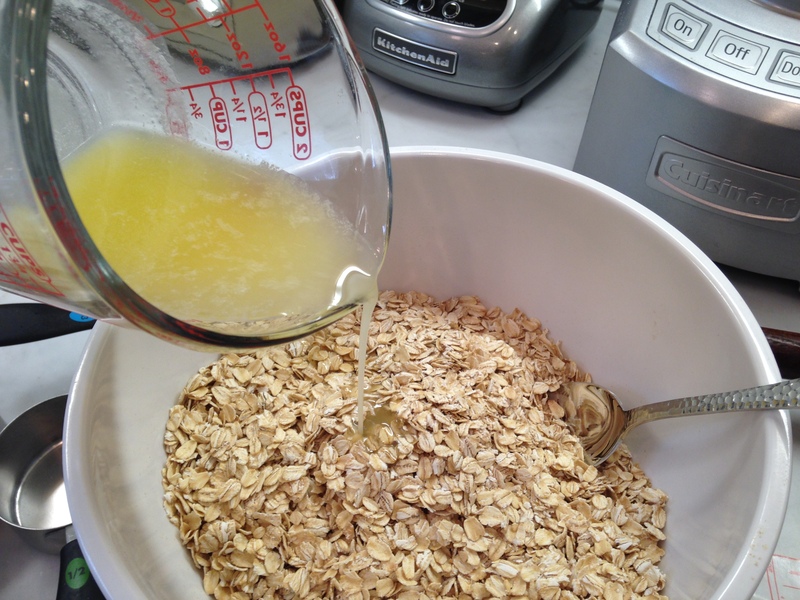 In a large bowl, drizzle this over the oats, add the salt, and stir. 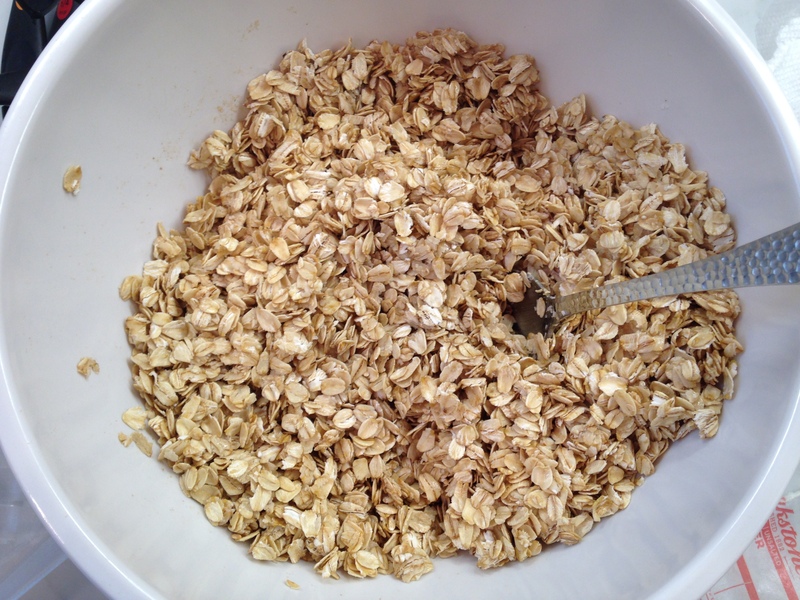 Until the oats are evenly coated. 3. 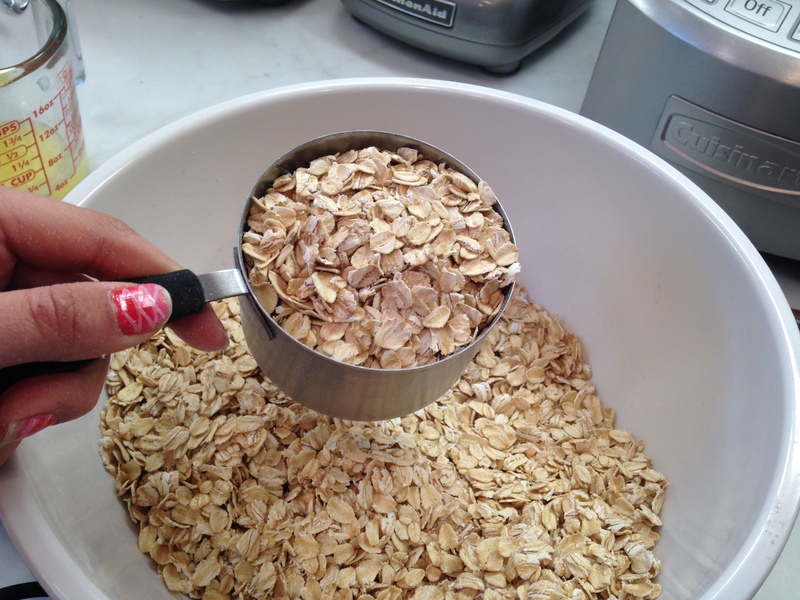 Spread oats onto baking sheets and toast in the oven for 15-20 minutes, shaking the pan a few times so nothing burns. Set aside to cool. 4. Bring oven temperature down to 325 F.
5. 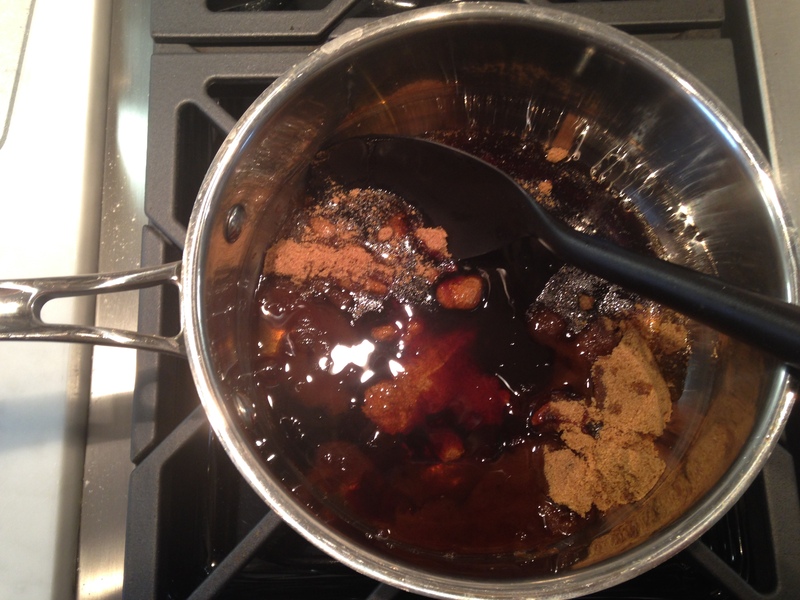 In a saucepan, combine brown sugar, honey, molasses, and apple juice. 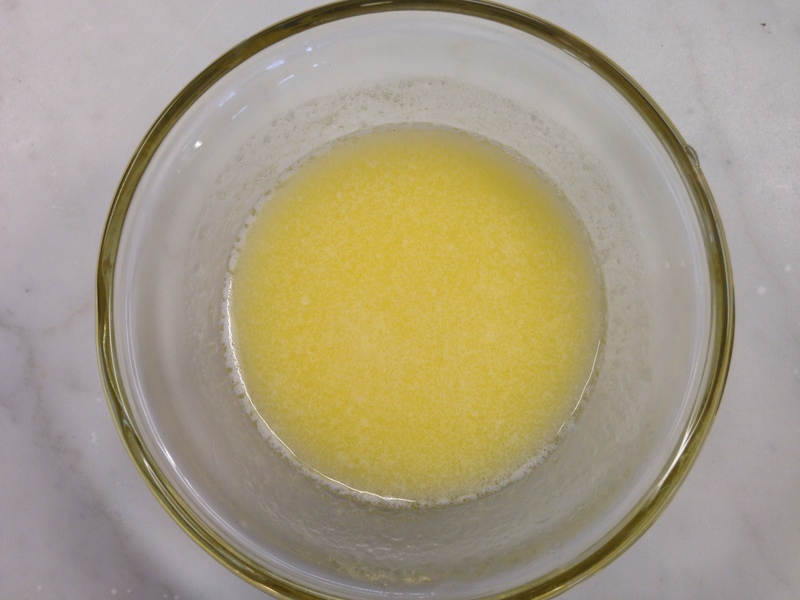 Heat slowly while stirring until combined and bubbles are just starting to form. 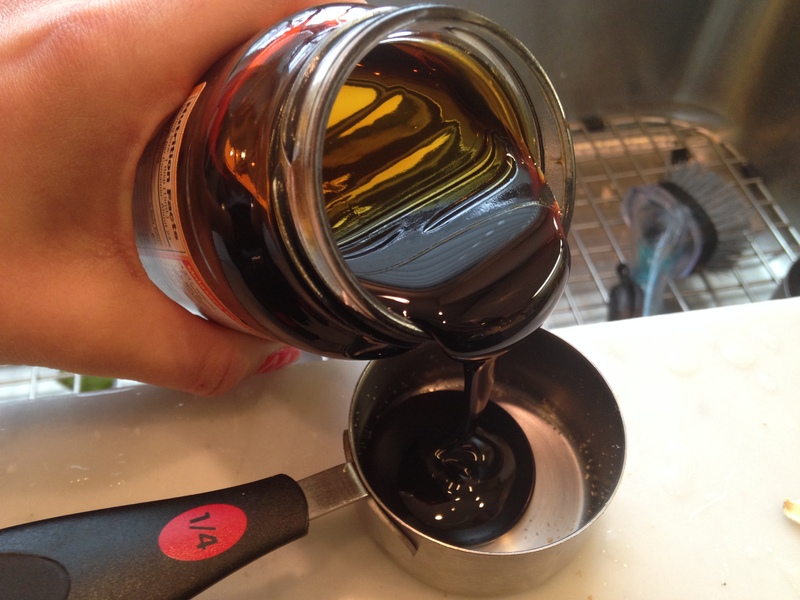 Turn off the stove and mix in vanilla. 6. 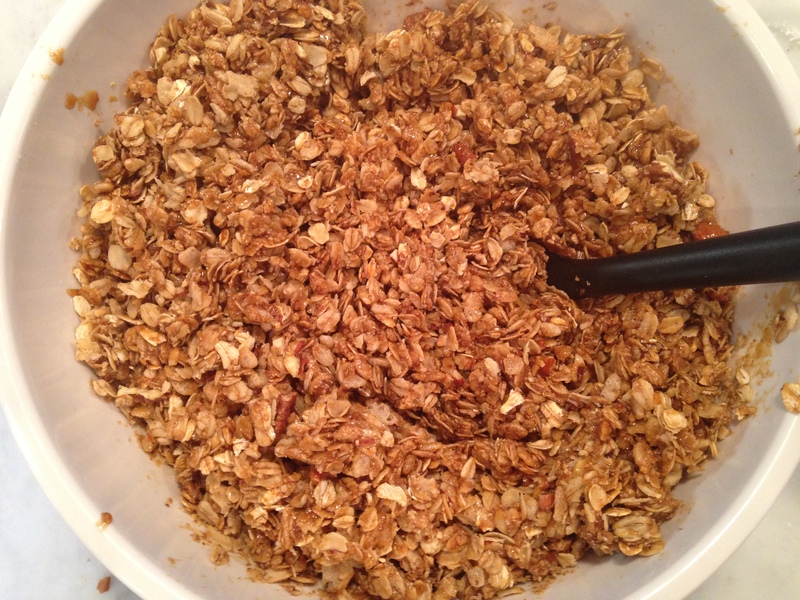 Combine toasted oats, wheat germ, nuts, and cereal. 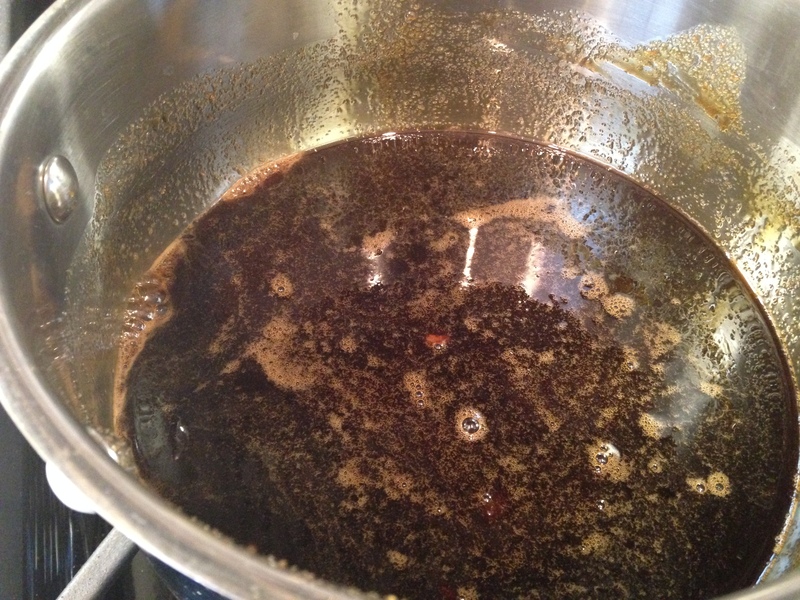 Pour in the warm liquid mixture while stirring. Mix until all is combined. 7. 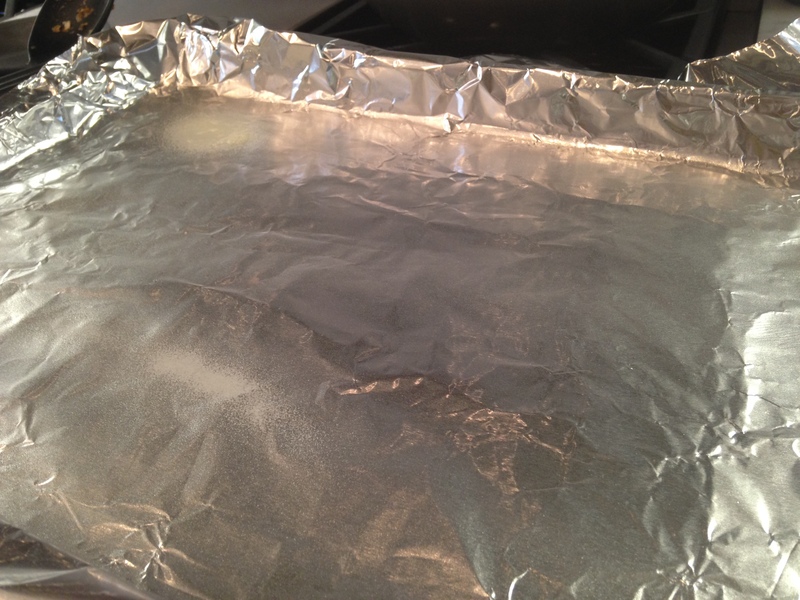 Line a rimmed baking sheet with foil and grease with cooking spray or butter and press mixture in, making sure it is evenly distributed. Bake until golden brown, around 20-25 minutes. 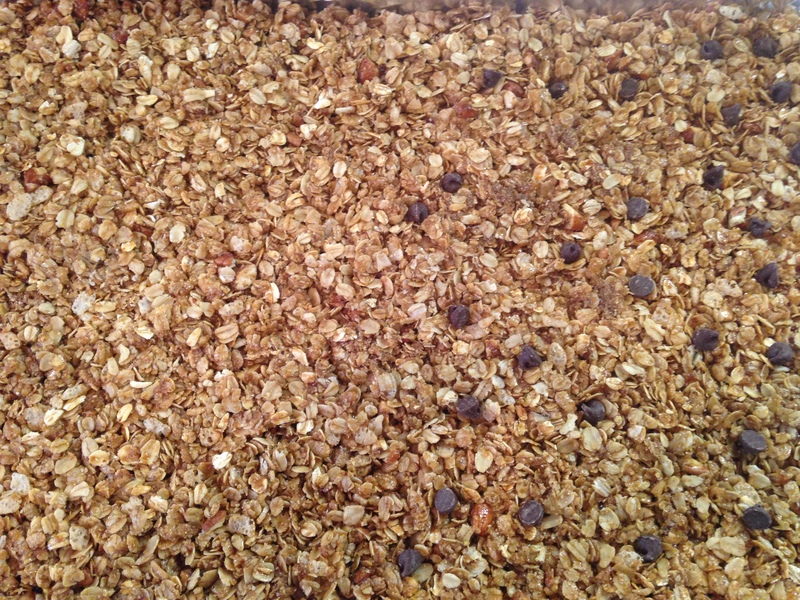 The granola may still be soft, but will crisp up. Set aside to cool completely. 8. 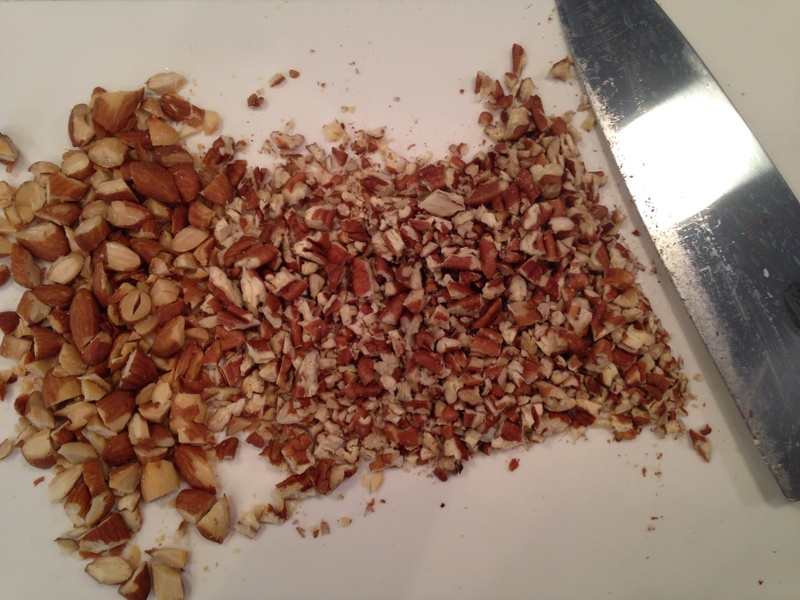 When cool, remove from pan and peel off the foil before cutting with a sharp knife. 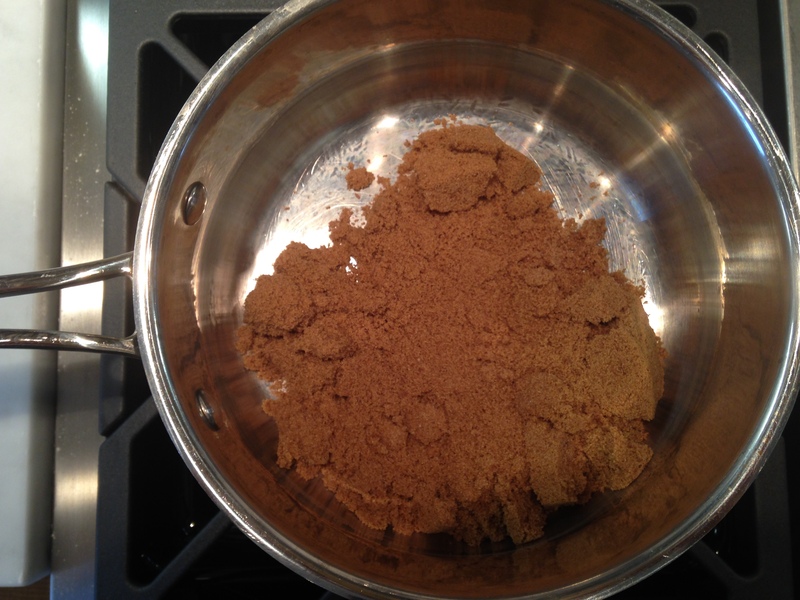 I hope you all take the time to try this recipe– it’s a new favorite of mine. Happy nibbling!